I recently returned to my home base of San Francisco from Louisiana after a week covering the oil spill for the NewsHour. It was a fascinating and frustrating week. But trying to find out what was going on was sometimes impossible. The best example occurred on the first day. Producer Joanne Elgart Jennings, cameraman Brian Gill and I were in Venice, La., that tiny outpost on the Gulf, more than two hours’ drive south of New Orleans. We had heard BP was setting up a health center after several workers had become ill, possibly from oil fumes. We thought that might make a good story. Someone pointed us to a building, where we were told we couldn’t get in without a pass. Well, where could we get a pass? Someone pointed to another building. When we got there, they kicked us out — politely — and gave me a BP pen. It was more than 90 degrees outside, and one of the folks who had denied us access did give us some cold bottled water, but no access. I still don’t know what was going on in that building. And nobody would talk to us either — and not just at the supposed medical site. Wherever we went, the “word” seemed to be out: don’t talk to the media. On a dock at Venice, where workers who had been hired by BP were coming back from cleanup duties, we couldn’t get a comment from anyone. We saw them sitting around after their boat trip back, but we were told by coordinators on the dock not to talk with any of them. Then, a couple of days later, we managed to get a helicopter ride out to an oil production platform. The oil executive who arranged our trip and went with us was happy to talk — about how important the oil and gas industry was for Louisiana, and why the government shouldn’t prohibit new drilling. But the owner of the platform — not BP — was uncomfortable with us talking with the six workers on the platform, since they didn’t have any management people there. When I traveled to Porte Lafourche — also on the Gulf — I interviewed a Coast Guard officer who was pleasant and somewhat helpful. 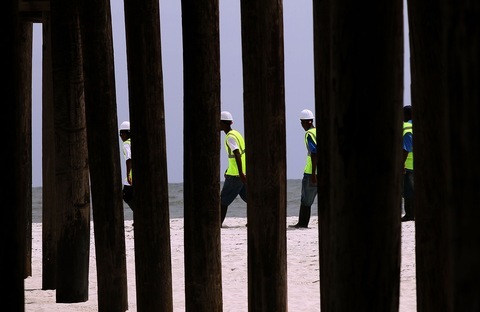 The Coast Guard’s job, he said, was to oversee what BP was doing to clean up the spill. But when I asked how it was working out, whether BP was doing its job, what grade he would give the company, he couldn’t venture an opinion. My experiences were admittedly limited, and I wasn’t dealing with high-level people. We found others to talk with, and the NewsHour did get some access. But dozens of journalists experienced the same frustrations. The Society of Professional Journalists wrote to President Obama the other day, as did several individual reporters, complaining about lack of access to sites and to people. Coast Guard Adm. Thad Allen told ABC’s Jack Tapper that he has ordered that oil spill operations be open to the media, except when it’s a security or a safety problem. Allen said the government wants BP to have a similar policy — and that he will “have a call with Tony Hayward,” BP’s CEO. In response to the SPJ, the government has said it will move the primary location for news conferences to a more convenient site, and provide daily situation briefings. The Coast Guard has asked BP to do twice daily updates. For its part, BP says it is not trying to restrict access. I talked with John Pack, who — until two years ago –worked as a public relations officer in England with BP. He was called back and sent to Houston to help in the oil spill crisis. He said there is no dictate to employees not to talk to the media, although there are some clauses in contracts that require that press inquiries be referred to the press office. Whether the company is trying to improve its relations with the press — or whether there’s a corporate culture to keep the lid on — remains to be seen. On the ground, it’s hard to tell if things have improved. But since officials are saying the cleanup will last into the fall and beyond, there’s plenty of time to evaluate whether the public is getting the full story.